Are you a survivalist who only takes one item? 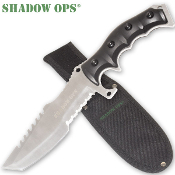 You need this 11" Shadow Ops Survival Combat Knife. The 6" stainless steel half-serrated saw back blade reads, "Shadow Ops" and will cut through anything. Full tang blade(goes through the handle) for extra strength with black sure grip handle overlays. Strap it to your belt with the included nylon sheath that reads, "Shadow Ops", and you're ready for action.